One of the more impactful community investment choices that a company can make is to create a multi-year agreement with a community partner, and more and more companies are making these a significant proportion of their activities. 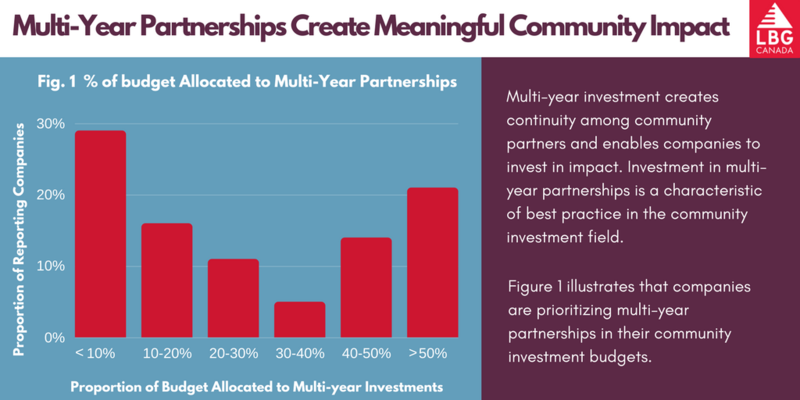 The average amount invested in multi-year partnerships continues to grow year over year, with almost a quarter of companies investing half their budget, or more, into longer-term agreements. In addition to the positive effects on the community, there is also a strong relationship between the amount that a company invests into multi-year partnerships, and the amount they are leveraging from their external stakeholders, showing that others in the community are willing to follow their lead. LBG Canada is a network of corporate commuity investment professionals from many of Canada's leading companies, who work together to apply, develop and enhance the use of the LBG Model and impact measurement framework in Canada.